Type 0 known as Unrestricted Grammar. Type 1 known as Context Sensitive Grammar. 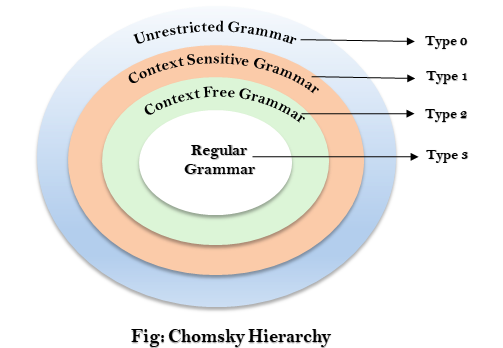 Type 2 known as Context Free Grammar. This is a hierarchy. Therefore every language of type 3 is also of type 2, 1 and 0. Similarly, every language of type 2 is also of type 1 and type 0, etc. Type 0 grammar is known as Unrestricted grammar. There is no restriction on the grammar rules of these types of languages. These languages can be efficiently modeled by Turing machines. The context sensitive grammar may have more than one symbol on the left hand side of their production rules. The number of symbols on the left-hand side must not exceed the number of symbols on the right-hand side. The rule of the form A → ε is not allowed unless A is a start symbol. It does not occur on the right-hand side of any rule. Where the count of symbol in V is less than or equal to T.
Where A is any single non-terminal and is any combination of terminals and non-terminals. Type 3 Grammar is known as Regular Grammar. Regular languages are those languages which can be described using regular expressions. These languages can be modeled by NFA or DFA.